I am extremely upset right now. I am conflicted right now with a bout of “justice will be served” and a “Jack Rudy” type mentality swirling in my mind. This is not only getting too commonplace, but this senseless violence has now crept into my baseball life with the blunt force of a hammer to the back of the head. I was on my way back from the grocery store late last night and saw the St. Petersburg Police vehicle with its light filling the night as it sprinted down 4th Street at breakneck speed. It wasn’t until I got home and turned on the local cable news program that I learned that another officer was down in the streets of St. Petersburg, Florida. Instantly I was hoping it was not either officer Lopez, or my ex-college roommate Lt. Wyatt. Instantly my heart sunk thinking another family would have to go through the unbearable pain. I prayed to every identifiable deity I could think of wanting a positive outcome after already seeing two other SPPD officers fall this year. But this one struck me deep to my center core. This one became so personal it outraged me, angered me to the point of wanting to go out and search for the culprit myself. Saddened me to the core because this sleepy hamlet is not the kind of town you would associate with violence, much less an act upon a law enforcement officer. I had just attended a charity golf tournament that very morning at the Feather Sound Golf & Country Club to help the families of two other SPPD victims of violence. But this one. This one senseless act has me almost ready to go Charles Bronson on someone. I am sorry if I offend anyone today with this post, but I got to vent. I got to let this go, I got to get the emotion out before it eats me alive. We lost another valuable member of our Tampa Bay Rays extended baseball family last night. It wasn’t until this morning that I knew it was the same baseball savvy officer who has laughed, joked and even been at our side for so many Tampa Bay Rays games down near the Right Field Bullpen area. I can not remember a single game day that I did not see officer David Crawford, even in street clothes attending a game down in that region of Tropicana Field. One instance really comes to mind right now. Someone had hijacked my ticket out of my back pocket while waiting to get into the Trop., and Crawford was outside patrolling before the doors opened. He noticed I was in the ticket line to get a replacement ticket for the game and immediately got word out on his radio that my ticket was gone. It was personal, it was the right thing to do, it was totally what he did for his baseball friends. But he was more than a baseball friend to me. Through the years talking to this 25 year veteran of the SPPD we spoke about so much besides baseball. My uncle, Harold Smith had been Chief of Police in St. Petersburg and we talked about his early photo in the Police station’s main hall with him on his motorcycle taken in the 40’s. I met his wife when he came to a game off duty dressed in an old Rays shirt almost blending into the crowd. But he could never blend totally. For he was the guy you remembered after the first encounter. Whether it was one the job, or outside the ballpark his huge personality and heart just grabbed at you. He also had a good baseball mind. Keen to the little nuances of the game and eager to strike up a baseball-related conversation. I can not remember how many games started with me chatting with Crawford during BP or even him catching my eye as I walked down the Trop stairs to my seat. I knew I was in my baseball home when I saw him. It has not even been 12 hours yet and I still find myself so emotional about this senseless act. I have busted a few cherished items, pounded a baseball against a concrete wall until it has almost gone misshapen, I have not slept a wink. This one was personal to me. Cut me to the core, and will hurt for a long time. The 2011 games will not be the same for me. Sure the excitement and the action will go on around me, but I will gaze back towards the Rays back Bullpen “Clubhouse” area waiting for Crawford to appear. But this time, his laugh and large personality will not appear, and that saddens me to the core. Late last night (Tuesday) the St. Petersburg Police had a young 16 year old come in with his parents to the Police Station. After several attempts of pre-fabing a story, the youth finally confessed to the crime. 16 years old and his life is over. He had just turned 16, so he might have never gotten a drivers license or even finished school. Now he will be charged with First degree Murder and because of his youth arrests mostly with property crimes, he might be tried as an adult and spend the rest of his life inside a prison. I am sorry, but nothing, not even the action of being stopped and questioned by a police officer is reason to pull a firearm and fire upon them. This was a kid that was not a hardened criminal or a habitual violent offender. Now agreat baseball loving fan, a friend, father and husband will forever be gone from our gaze. Senseless doesn’t begin to describe it. I am not a huge god-fearing man, but I thank the Lord for the quick resolution and the action of closure, but I am still angry that David Crawford will no long joke, laugh and stand a post in the RF corner. I hope he gets front row seat to the ballgames in heaven…he deserves it! I am so sorry Cliff. It just breaks my heart when I hear of police officers losing their lives in the line of duty. Rest in peace officer Crawford. My condolences to you and his family and friends. You would have liked this guy. Full of life and one of those people who messed with you, but you knew it was because he liked you. Not imposing as an officer, but a defender of what was right. I remember once a bunch of Yankee fans were dissing a few women at a game and they got increasingly stupid when the girl’d boyfriend would go for food,beverage, etc. Finally when he was gone one time, Crawford came over and reminded the guys they could be escorted out and lose the privildge of watching the game. Suddenly the idots comments went silent for the rest of the night. That is the honorable guy I am going to miss the most. Very sorry to read this, both because another shooting always gets me mad and because the officer who lost his life was someone you knew. Condolences to his family and his baseball family. During the day I have contacted some people within that baseball circle and each and everyone of us saw Crawford at the Rays recent Fan Fest. He was a familiar sight at Tropicana Field, and a tremendous loss of a great person. Some people might not know that Crawford was great at family situations, always had a friendly ear and made those situation less stressful. This city one again on its knees less than a month after the first slaying of 2 fellow SPPD officers. Your story brought tears to my eyes. I did not have the honor of meeting officer Crawford, but I still remember the kindness extended to me by a SP officer when I was on crutches with a broken leg during the 08 playoffs and the general niceness of all the officers that surround the trop before and after games. Your story brought tears to my eyes. I did not have the honor of meeting officer Crawford, but I still remember the kindness extended to me by a SP officer when I was on crutches with a broken leg during the 08 playoffs and the general niceness of all the officers that surround the trop before and after games. So sad that all the money raised at fanfest will now have to be spit between not two, but 3 families and the heartache continues. Oh Cliff, I am tearing up just reading this, it was so sad and senseless. I am so sorry for your loss. My heart goes out to Officer Crawford’s family and friends. You have written a beautiful tribute for your friend. He sounds like he was a wonderful, giving person full of good humor and that the world is a sadder place for his loss. I just got done watching the news conference with Chief Harmon, and you can see that this is a huge blow to a police force that is already shaken. 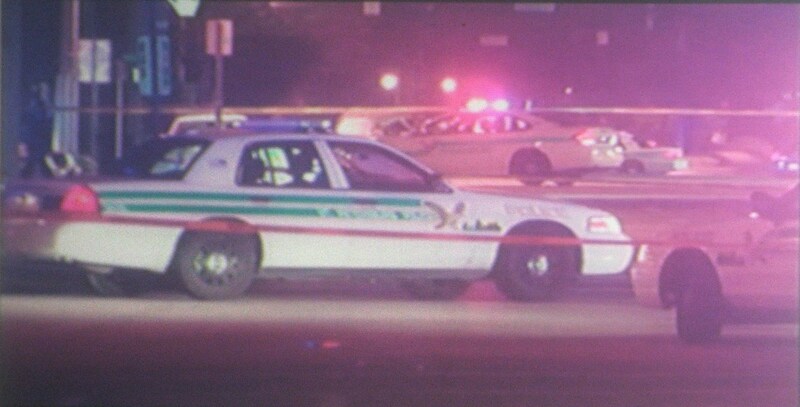 The Tampa Bay community has now seen 5 officers killed in the line of duty in about a year. This community needs to stand proud and tall for those in uniform right now. 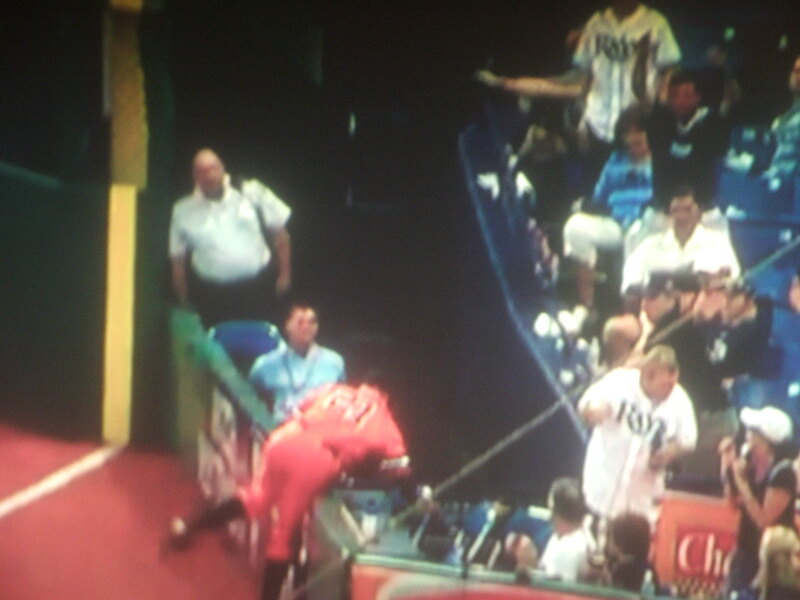 Becuase this happen within a block of the Trop, where Crawford loved to be is…….mind numbing. He was one of those ” good ones” we speak of sometimes when remembering people in our lives. I always got a kick out of him during the Red Sox and Yankee series when the tempoers and actions got a bit heated. He always stayed under control, and the other side came to their senses. That is a special breed of person who will wait for the eye of the storm to pass like that.. There is already some second guessing being done here locally, but this can not be second guessed….they definitely broke the mold after him. Man that’s a shame. There really is a problem out there when 16 year olds are roaming the streets with guns. I know it happens, but something has to change. A lot of people did not register from the first photo shown since it had David with a bunch of hair. But the moment I heard the name I knew instantly. I know he did a lot of the off duty security both at the airport during the 2008 celebration. It is one of those moments in life you want to question the CReator, or possibly have a few four-letter words with him. In the end, it was a tragedy that I wish I could turn back time and prevent, but I do not possess such a grand tool. When I was this kid’s age, we fought with our hands, not weapons. Even in my teens, kid’s squared off and fought the honorable way. But as times changed, so did the means of battling for one’s honor and pride. I have only branished a weapon for security and to fight for my country….any other reason is just opening the prospect for disaster.